The competition on the deregulated European telecom markets is continuously increasing and the need for a competitive edge through value added products and services is greater than ever. Therefore, Viking Telecom, one of the major suppliers of Least Cost Routing products in Europe, now proudly presents a new product line of CallCorrect Dialler-Phones. The CallCorrect Dialler-Phones presents not only the traditional Least Cost Routing functionality but also, the concept itself, assures high level of routed traffic since wireless phones are more frequently used than stationary phones. Also the fact that one DECT base station handles up to six handsets provides an environment were most calls within the household or small office will be routed. All calls generated via the wireless router phone will be re-directed via the alternative operator regardless of the users pre-selected operator. The wireless router phone is not an ”unknown box” but a real telephone, a familiar product, easy to install and use on a daily basis. The phone itself and its features presents added value to the customer. The idea is to provide the alternative operator with the ultimate tool for securing the traffic and presenting VAS (value added services) to their customers. Something that gets more and more important as competition gets tougher. All programming, configuration and reports are regardless of type of Viking Telecom dialler performed from the same Management System platform (CCRMS+). 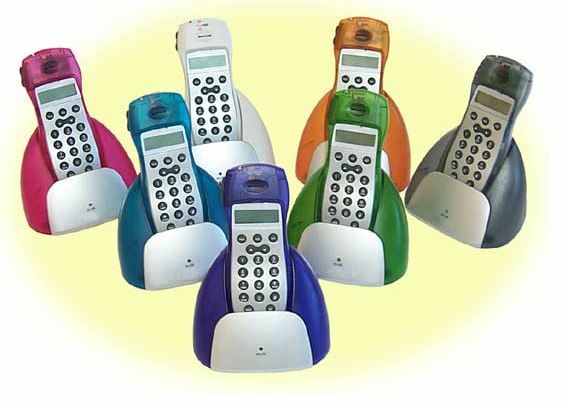 General: 10 channels with GAP compatibility, Register hand sets/ up to 6, Register base/ up to 3, 72 hours stand by time, 8 hours talk time, Simultaneous call possibilities, Intercom between all registered hand sets, Auto talk, Auto stand by, Call transfer between hand sets, Call waiting indicator for incoming internal calls etc. Hand set: 20 memory dialing (24 digits) with 12 characters, Last 10 number re-dial (24 digits), Mute and recall buttons, Ringer volume control, receiver volume control, Call timer display, Low battery indication, 4 ringer melody selection, Hand set LED indicator for ringing, Real time clock function, Hold function for call transfer, Out of range audible indication, Keypad lock etc. Base: Base paging facility to all handsets. As all Least Cost Router products within the Viking Telecom CallCorrect portfolio, the CCRPhoneD is compatible with the new CallCorrect Remote Management System (CCRMS+). When installed and activated, the unit calls the Management Server. The management server identifies the CLI and downloads the appropriate configuration file. When connected to the management server the router-phone will also receive information regarding when the next dial-in should occur. This is often chosen on a regular basis, for example weekly or monthly. Within the configuration file you are also able to define at what date the configuration file should be activated. This facility presents the possibility to re-program the whole router-phone fleet and have the new file activated on the same date. If desired, it could also be used for activating the new file on different dates. However, the system enables the carrier to continuously launch new services and/or decide what international and/or domestic traffic to re-direct via the network. The later, proven to be very important especially for domestic traffic. Optional: Local standard Ptt connector. Routing function: Routing function: For every received digit, the CCRPhoneD makes a check towards the routing tables, looking for match or mismatch. When a match or mismatch is identified the CCRPhoneD handles this accordingly to the valid procedure.